Фотобанк Rusmediabank – лицензионные Фото, Видео, Музыка - Man face. Handsome unshaven and young smiling man with headphones listening music outdoor on sunny day. Guy with headphones on neck. Man face. 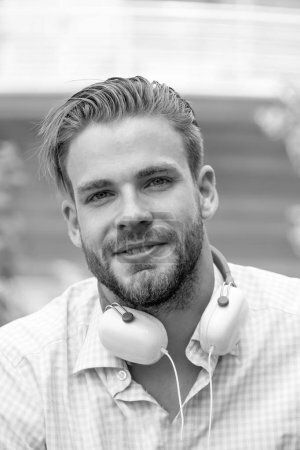 Handsome unshaven and young smiling man with headphones listening music outdoor on sunny day. Guy with headphones on neck.